William Jewelers, a family owned and operated jewelry store, opened its first doors in November, 2001 in Palmdale, California. William Jewelers was opened and is operated with the intent to provide high quality merchandise at the lowest possible competitive prices. Mohammad and Lynda wanted to open William Jewelers outside the mall in an independent location so they could really listen and understand customers needs. To give the best customer service to be found anywhere. Catering to the community and the people with high quality service and keeping costs to a minimum are the goals of this family business. William Jewelers goes out of its way to contribute time, money and attention to the local charities of its store location to give back to their community that gives so much to them. 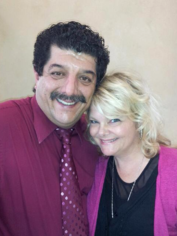 Mohammad and Lynda are the owners and hands on operators of William Jewelers. Mohammad has 27 years plus experience in his field. He is a self-motivated certified GIA diamond specialist. He brings his many years of qualified experience and diamond expertise to the owning and operating his stores. He is dedicated to bringing high quality standards along with superior customer service to the industry. William Jewelers' motto is "Creating Special Moments." How do they maintain this motto? William Jewelers keeps the selection varied and interesting, not only by selecting one of a kind pieces from unique vendors at special trade shows but also by making custom designs in-house. "We can do virtually any kind of custom jewelry and have full time jeweler on the premises, and a watch and clock repair center also" says Mohammad. William Jewelers also has exclusive lines of jewelry such as "Triton", ArtCarved and Goldman which keep us successful in providing special branded pieces of jewelry. Motivated by the success of their diamond lines, they continue to provide a wide selection of beautiful and high quality designs of today’s fashion and also yesterday’s classic impressive choices. Their colored stone selections are also outstanding in selection choices and design. You have the choice to bring in your own stones to remount or choose from William Jewelers amazing array of precious and semi precious jewelry. William Jewelers will continue to rise in success due to the superior customer service and quality of the merchandise they share with the public to create their own Special Moments..